The building materials, tools, equipment and building practices you implement will make or break the success of your company. If you can’t produce tangible results due to hasty building processes, or if your tools are impeding the flow of your project, it could be time for an efficiency upgrade. Different professional construction tools and building equipment can thoroughly impact your building process. Making the decision to invest and utilize in more efficient, more reliable devises can be a great asset for your business. When it comes to efficient tracking and communication, mobile technologies are continuing to advance in order to increase construction productivity across the job site. The construction industry is under constant pressure to consistently decrease costs and operate at even lower profit margins. Mobile technologies are helping to turn this desire and necessity into a reality. Recent technological advancements are helping to automate and simplify the capture and transmission of information from the job site back into company systems. The concept here is that even reducing small project efficiencies can have large scale effects. One of the largest expenses of a job project has to do with the effective reporting of job related costs, including labor hours and equipment use. Mobile alternatives help to automate this process and keep the flow of information steady, instead of having to rely on tedious paperwork. By improving data accuracy and project tracking, it’s much easier for construction firms to lower project costs and reach greater levels of efficiency. The tools you end up using across the construction site can have a tremendous impact on the efficiency of your company. If you’re using older tools, or don’t have effective tracking methods in place, you could be losing money without realizing why. Compaction equipment is used in order to produce a higher soil density. Compaction equipment will vary depending on the job site and the level of compaction needed. Grading equipment is used in other ways to shape the earth to a certain elevation of a desired shape. The grading equipment used includes both motor graders and grade trimmers. Rock excavation is usually a very arduous task and is very time and labor intensive. Rock excavation includes the processes of loosening, hauling, loading and compacting. Drilling and blasting to loosen the initial rock is done by percussion drills, rotary drills, and rotary-percussion drills. A jackhammer is one of the most common pieces of drilling equipment and is very versatile throughout the entire process. Throughout the blasting process explosives such as dynamite can be used, as well as specialized blasting machines. A derrick is a vertical mast and an inclined boom that’s supported from the base. Derricks are used to lift equipment or materials in both industrial and building construction. 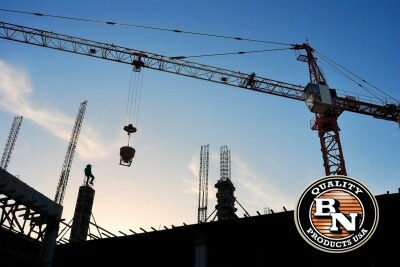 Tower cranes are used in order to lift loads to very great heights, which can assist with building steel structures. The most common tools used in mixing and paving include concrete mixers, truck mixers, paving mixers and varying distributers. Truck mixers help to transport ready mix concrete to construction sites. Paving mixers are self-propelled and are used to disperse concrete in a more controlled manner. Paddle mixers are also incredibly useful for distributing concrete across varying surfaces and areas on a job site. If any of your tools rely on external power sources it’s important to ensure you have adequate power sources that are also efficient. This includes battery charging stations as well as portable generators. Some power tools such as drills and saws are more efficient than others, and also more comfortable to use. It’s important to take both of these elements into account when choosing your power tools. There are many diverse types of efficient building materials, and developments are always improving. It’s important that you explore all of your options when choosing your materials for your next project. Having top of the line professional construction tools will help to increase the efficiency of any job site. No longer do you have to worry about tools breaking, or have to constantly repair aging tools. Even though the investment for new tools will be a little steep in the short term, you’ll be able to make up the initial investment fairly rapidly with increased job site efficiency. Overall, the equipment you end up selecting to complete a job will have a very immediate effect on the speed at which you can complete a job. Often, investing in the highest quality tools possible is the best decision for your business.